Sirens sings with Cantabile this April! The Cantabile Society will close its 2014-2015 in a celebratory style, featuring its first performance outside of Nova Scotia in a quarter century and a collaboration with a dynamic vocal ensemble from PEI! Our second annual Cantab-elation Celebration – Joyfully Making Music Together concert will feature the Cantabile Singers of Truro and self-directed women’s choral ensemble Sirens from PEI coming together in song for a weekend partnership on April 18 and 19, 2015, with a concert in Charlottetown on Saturday afternoon and a concert in Truro on Sunday afternoon (where they will be joined by our own Cantabile Boys’ Choir)! 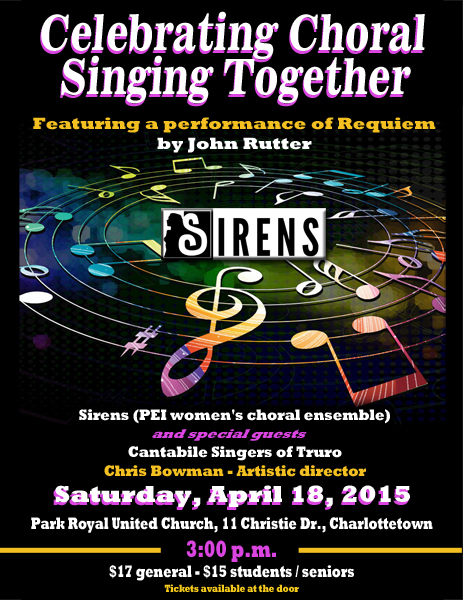 On Saturday, April 18, 3:00 p.m. at Park Royal United Church (11 Christie Drive, Charlottetown, PEI) the Cantabile Singers from Truro, NS will join PEI’s own Sirens women’s choral ensemble for a concert Celebrating Making Music Together! Each ensemble will perform on their own and then will join forces to perform John Rutter’s Requiem. Tickets are $17 ($15 seniors/students), available at the door. On Sunday, April 19, 3:00 p.m. at First United Church (711 Prince Street, Truro, NS) the Cantabile Singers and Cantabile Boys’ Choir (Chris Bowman, artistic director) will host PEI women’s choral ensemble Sirens for Cantab-elation Celebration – Joyfully Making Music Together! All three groups will offer a selection of music on their own and then combine their talents to perform John Rutter’s Requiem. Tickets are $17 general, $5 students, 12 and under free, available at MacQuarrie’s (Esplanade), from choir members, and at the door. Now in its 33rd season, the Cantabile Society was formed in 1981 for the purpose of supporting the activities of the 50-voice community choir the Cantabile Singers of Truro. Since then, its activities have expanded to include the creation of the Cantabile Boys’ Choir, the Spotlight Musical Theatre program and the annual Choirs for Comfort program. The Cantabile Singers of Truro, the Society’s flagship program, provides eclectic concert programming for its audience in Truro and around the province. Succeeding previous directors Jeff Joudrey and Ross Thompson, Chris Bowman began working as Artistic Director of the Society in 2013. This season, the Cantabile Singers have presented a pops concert “On the Radio” featuring popular music from the 1950’s to present day, and an acclaimed performance of Handel’s Messiah featuring a spectacular line-up of soloists representing all of Atlantic Canada.